Ructions as poor financial management and zero dollars from the US drain the UN’s so-called ‘green climate fund’. Even agreeing an agenda was a major struggle. Rich and poor country representatives clash over policy priorities and replenishment at Green Climate Fund board meeting, reports Climate Change News. In the context of Donald Trump’s US cutting off contributions to the fund, however, Okamoto’s comment rankled with some. He said there had been a “serious lack of consultation” and the chairs had not responded to comments regarding the agenda before the meeting. The barely veiled hostilities come as the fund faces a cash crunch. It has $2.8 billion left to allocate from its start-up donations. Projects up for consideration on Wednesday would claim $1bn of that. As well as the US withholding $2bn of its pledge, the pot has lost some $1bn in value due to exchange rate fluctuations since 2014, officials reported. Discussions on how to top up the budget were rolled over to the final day of the meeting, after lively but inconclusive talks on Tuesday. Ian Callaghan of climate finance network NDCI Global, who has been tracking the progress of the fund remotely, said it needed to be to be “de-politicised and professionalised”. “Let’s hope one outcome of this very public meltdown at the GCF is a proper debate about how such an overhaul could be undertaken, because without it climate finance will remain a backwater rather than the mainstream asset class it needs to become if the trillions are to be mobilised, especially for developing countries,” said Callaghan. Who is going to supply these ‘trillions’? Nothing from the US with Trump in charge. Only $2.8B left! Only in the field of climatism could that be see as a serious shortage of money. Perhaps they should stop now and give it back? I’m guessing that, given the tap appears to be about to be turned off, all of that 2.8bn will be allocated to salaries and ‘conferences’ (parties). I wonder how long the Green Blob can exist on 2.8bn? Not very long, I suspect…. 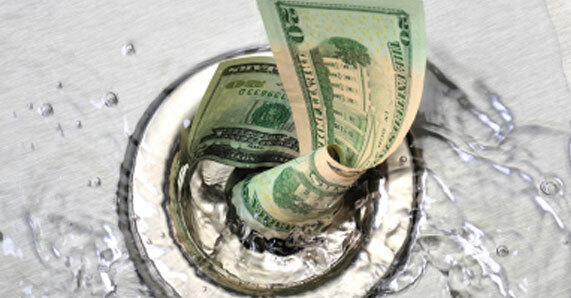 DRAINING one of the biggest swamps of all – the U.N. and its scandalous “Green Climate Fund” aka wealth redistribution scam. THANKS a $BILLION times over Mr President, Donald J Trump! exchange rate fluctuations sounds fishy? Poor, starving babies, only “$2.8 billion left” in the piggy bank. How tragic. The Ecoloons are running out of OPM to fund their parties. OH! my, the end of the world approaches. Their World! Is Paul Oquist related to Ben Oquist, former Greens chief of staff and now Executive Director of the Australia Institute? Pigs squealing and scrapping as the trough runs dry. The surface cannot do that because of a contiguous participating media, i.e. atmospheric molecules, moving over 50% ((17+80)/160) of the surface heat through non-radiative processes, i.e. conduction, convection, latent evaporation/condensation. (K-T diagram) Because of the contiguous turbulent non-radiative processes at the air interface the oceans cannot have an emissivity of 0.97. I’m not sure what you mean by “a GHG up/down/”back” LWIR energy loop. ” There’s no “loop” involved in the (misnamed) “greenhouse warming” effect, through which radiatively active gases like CO2 help warm the Earth. The word “back” in that phrase suggests that you might be talking about infrared back-radiation, emitted by GHGs in the atmosphere, which helps warm the surface. It is real, and measurable. The only people who dispute that fact are crackpots. No, the “GHG energy loop” is just a product of your confusion, and the greenhouse effect (though badly named) is unquestionably real. Peruse the three links above to learn about it. In fact, the existence of the greenhouse effect is just about the only thing in the field of climatology that there really is a scientific consensus about. Where the alarmists go off the tracks is when they pretend that the consensus that anthropogenic climate change is real is a consensus that anthropogenic climate change is harmful. The best evidence is that anthropogenic climate change is modest and benign, but it’s not zero. daveburton, for a greenhouse effect you have to have a ‘roof’ where you will find the hottest temperatures. No such thing occurs on Earth. The vaunted Mid Tropospheric hot spot does not exist and never will. Our atmosphere is open to space and radiation and convection and conduction guarantee it will be colder at the top than at the bottom as is the empirically proven case on this planet. Have none of you read Scafetta or Nikolov and Zeller? or the myriad of Physics and thermodynamics papers on this idiotic AGW scam? stpaulchuck, a real greenhouse does, indeed, require a roof, because the way it works is by preventing air movement. That’s why I said that the so-called “greenhouse effect” is misnamed. But it’s still real. Nicola Scafetta is a friend of mine. (He used to be a professor at Duke U., which is near me.) He’s a physicist, so he would never dispute the warming effect of GHGs. At one time he did some work with one (or maybe more than one?) of the climate models, in which he tweaked the modeled sensitivity to various GHGs, and compared the adjusted model’s output with historical temperatures, and found that a better fit was obtained when the effect of CO2 was reduced and the effect of CFCs was increased. Take at look at those links I posted for nickreality65. Rather obvious that you are mistaking temperature of atoms for air temperature. If I take you up to 50,000 feet and expose you to the elements you will freeze to death before you die from lack of air. Both of which will happen fairly quickly. The “Green House” effect is caused by the insulation of effect of Oxygen&Nitrogen of the lower atmosphere that blocks radiation from the surface to the deep cold of space. Convection is needed to lift energy laden gases up to the Troposphere where the gasses are thin enough to allow radiation to predominate. Energy content in a volume of gas is not the same as energy content of an atom, even if their “temperatures” are the same. Only the density of the gas relative to the ability to radiate energy away is important. Radiation is a fast way for atoms/molecules to shed energy, conduction is much slower, convection lifts the energy laden gasses up to where they can radiate energy into space. A real greenhouse uses containment to block convection. The air temperature is the average temperature of the air molecules which compose it. I’ll take your word for it. My guess is that it might depend on what I’m wearing. The temperature at that altitude averages about –80°F. Just the opposite. The reason additional CO2 has only a small warming effect is that at 400 ppmv there’s already so much of it. GHGs are colorants. They tint the atmosphere (albeit in the infrared, rather than the visible, part of the spectrum). The Precious Air Fertilizer acts as a dye in the atmosphere, which “colors” the atmosphere in the infrared, esp. around 13 to 17 µm. If you’ve ever added food coloring to a recipe you should know that it takes very little dye to make a big difference in color. Additional CO2 has only a small greenhouse effect, because the atmosphere is already nearly opaque in the affected absorption bands, because there is already so much CO2 in the atmosphere. MODTRAN calculates that 50% of the warming effect of current (400 ppm) CO2 level would be accomplished by just 20 ppm CO2 (for a tropical atmosphere w/ constant relative humidity). The NCAR radiation code says that 40 ppm CO2 would be needed to get 50% of the current CO2-caused warming, rather than 20 ppm, but, either way, the lesson is clear: we’re well past the point of diminishing returns w/r/t the warming effect of CO2. That big green notch is the proof that CO2 causes warming: it represents energy emitted from the surface of the Earth which did not escape the atmosphere, because it was absorbed by the CO2 “dye” (albeit, a dye which colors the atmosphere in the LWIR, rather than the visible). Now, the “man-made” part is slightly trickier, because most of that 13-17 µm section of the spectrum is already pretty thoroughly saturated. Adding CO2 raises the effective emission height, but from about 14-16 µm the emission height is in or near the tropopause, already, so raising the emission height has little effect on radiative balance. 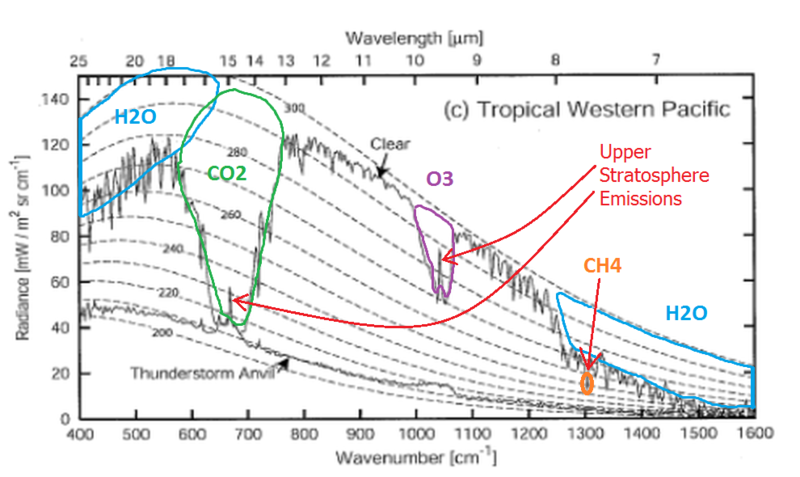 But at the fringes of the absorption band (especially on the shorter side, where water vapor has little effect, say from 13-13.5 µm), additional CO2 does have an effect, broadening the absorption band, and raising the emission height. That certainly should have a warming effect. But how much? The usual estimate is a little over 1°C of warming per doubling of CO2, at equilibrium, from the direct effect of the CO2, absent any feedbacks. However, in 2014 Prof. Will Happer did a Physics Colloquium at UNC, in which he took a deep dive into this question. He explained why the warming effect of additional CO2 is logarithmically diminishing, and he reported finding evidence that the far tails of the fine line spectra of CO2 are commonly inaccurately modeled, with the result that the calculated direct warming effect (before feedbacks) of additional CO2 is commonly overestimated by about 40%. That bio mentions that, among Prof. Happer’s many other accomplishments, he is the inventor of the Sodium Laser Guide-Star. What the bio doesn’t mention is how revolutionary that invention is. 2. By emitting a LWIR photon. #1 is several hundred million times more likely than #2. 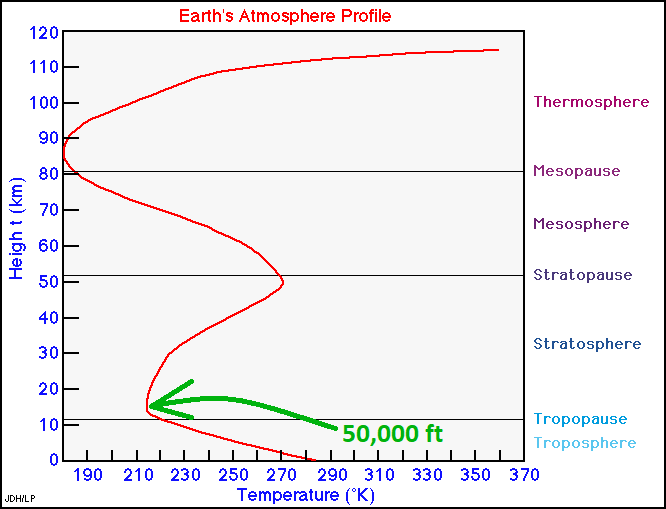 Daveburton – you graph indicates that at 1125 km above the earth the temperature is about 360 K = 86 celsius. What is being measured here? I always though space was really cold, or has the graph been truncated to hide the full picture? That really is the temperature. But the atmosphere is very, very thin. So even though the air molecules are quite hot, there aren’t many of them, so a given volume of atmosphere contains little thermal energy. A vacuum is neither hot nor cold. @daveburton, you mention the use of models to support your ideas. Are those models verified and if so where is the verification data so we can all check it? If they have not been verified their outpot isb’t worth the paper they are printed on and should not be considered to be anything more than garbage. GIGO in computer speak. As an engineer I have used models to get a first approximation but those models are verified and backed up with rigorous testing in the field. Lives of people depend on verified engineering models, if the same rigour was applied to climate models they would all be rejected as useless. those hot atoms and molecules in the thermosphere are directly heated by the UV and x-rays from the sun. As there is no ‘blanket’ to protect them they are directly excited and become hot. They do not heat the lower atmosphere and are not heated BY the lower atmosphere except in the most accidental way as energy radiates into space. There are not enough of them to heat anything. And BTW, why do you all stop your lapse graphs at the thermosphere? Why not continue into the ionosphere? The temperature of the sparse atoms and molecules continues to rise and fall with sunshine due to direct stimulation from solar photons of the right frequency, but defining ‘temperature’ based on a handful of molecules in cubic miles of space is disingenuous. As p.g.sharrow notes, that is not ‘temperature’ as commonly defined. Take a thermometer to that altitude and it will not say 86C. Far from it. Those graphs are the temperature of the bits of atmosphere (molecules) at that altitude. “Temperature” is the mean temperature of a volume of space at that altitude – cold, very very cold. Take the lapse rate of a volume of space as you rise in altitude and you will find some pauses but a clear trend of colder temperature with a rise in altitude until reaching ‘outer space’. As a licensed ham radio operator I am very familiar with solar stimulation of the upper reaches of the atmosphere, in particular the ionosphere. The sun heats it and causes it to expand and rise. The F layer even splits into sub layers. At night the ionosphere cools and collapses. Nothing to do with the lower atmosphere heating and cooling due to the sparse density of molecules in the ionosphere. The solar wind is orders of magnitude more energetic than the low frequency heat from the surface of the Earth, particularly at that altitude. Conversely, down at the surface where air pressure is high, there are a lot of molecules per unit volume and a lot of thermal energy. Non engineers really have no clue about Thermodynamics. There are 5 postulates of Thermodynamics (the second is often referred to as the 1st law and the fourth as the second law). The fifth postulate states”The macroscopic properties of homogeneous PVT systems at internal equilibrium can be expressed as functions of temperature pressure and composition only” A relation from the later for an ideal gas is PV=RT. So called “climate scientist” (who have no qualifications or experience in Thermodynamics and Heat Transfer) deny the existence of the postulates (particularly the fourth) which were developed by engineers more than 200 years ago and have been verified and used by hundreds of thousands (if not millions) of engineers ever since. For anyone that WANTS to understand the functions of the constituents of gases and liquids in our atmosphere/hydrosphere. Study the science of the Servel patent for continues absorption refrigeration. A tour-de-force in the physics of gas / liquid interface, of chemistry, under the influence of gravity. Add heat get cold! Then study the Sharrow patent on Gas – liquid contacting device and method to understand the interface of wind and water that has created our atmosphere by constantly scrubbing.it. It’s really that simple I guess. Daring to call money siphoned from tax payers for squandering on “climate change” a pitential legitimate asset class. Destroying the climate-con infrastructure cannit happen soon enough.